David J. Meyer was born in Clintonville, Wisconsin. He was born into a family where superstition and occultism were everywhere. His paternal grandmother and great grandmother were both practicing witches in the old wiccan tradition. When David was 13 years old he began his involvement with astrology, numerology and palm reading. This continued until age 19 and he became well-known in northern Wisconsin as a psychic astrologer. Many mysterious events made him popular with the people in that area. At age 19 a friend coaxed him to attend a small church where miracles and healing were said to happen. Being drawn first of all by curiosity, David attended a Sunday evening service where the Holy Ghost began to work conviction in his heart. At the end of the service he went up to the front and fell to his knees and repented before the Lord. The following week he was baptized in the name of the Lord. One week later, he was baptized with the Holy Ghost. It was an experience reminiscent of Saul of Tarsus on the Damascus road. After deliverance from many devils that came out from him, he instantly began to preach the Gospel of Jesus Christ in the streets. While continuing his ministry, David also assisted various pastors and completed his Associate of Arts degree at Fox Valley Technical Institute. He also completed 10 years of service with the University of Wisconsin system as a master locksmith in charge of physical security. During that time he won many awards and certificates including the highest award presented by the Governor of Wisconsin. David also did computer programming and security systems designing and analysis. 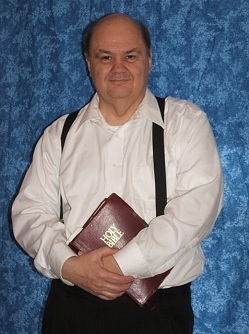 David J. Meyer was the pastor of Truth Tabernacle, a totally independent Bible-believing Christian church which he founded in 1974, located in Beaver Dam, Wisconsin. He was also the editor and publisher of the Last Trumpet Newsletter, which began publication in 1981 and currently has many thousands of readers. Pastor Meyer specialized in deliverance ministry and exposing the dangers of the occult and secret societies. He has traveled extensively from coast-to-coast doing research and spiritual warfare.